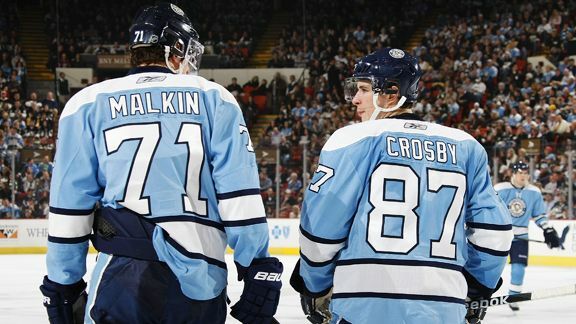 With names like, Sidney Crosby, Evgeni Malkin, Ilya Kovalchuk, Brad Richards, Chris Pronger, and John Tavares, the Atlantic division houses some of the biggest stars in the NHL. This division has perhaps the highest amount of star appeal with each team having at least one house hold name holding onto a spot on their respective rosters. Last season both the Philadelphia Flyers and the Pittsburgh Penguins surpassed the 100 point mark, and the New York Rangers came up just seven points shy of 100. While the New Jersey Devils would have probably hit the mark if they did not have a horrid first half to last year's season. The New York Islanders continue to be the odd duck in the conference, coming in last place in the division. Along with the star presence on the front end, the Penguins and Rangers are anchored by two of the best goalies in the league in Marc-Andre Fleury, and Henrik Lundqvist, talk about a one two punch. While the Flyers, a team who has struggled in the goalie category in the past, may have found their savior in signing Ilya Bryzgalov this off season. On the other hand, the Devils' future hall-of-famer Martin Brodeur, who posted his first losing season of his career last season, may be inching towards retirement. While the Islanders have came up empty handed on several attempts with Rick DiPietro, who seems to be injured more than he is healthy. However, where this division may stand apart from the rest of the league is their fan bases. The rich history, recent successes, and stand out stars make it easy for fans to cheer for their hometown teams.Sure other teams have very loyal fan bases, but every team in this division has them. Being that all these teams are not to distant form each other these fans have a hatred for their division foes that is unmatched through out the league. The fans that call Philadelphia home may be the most feared, tormenting the buses of incoming teams on various occasions. Stemming from the strong fan bases that follow each team is the bitter rivalries the teams have with one another. It does not matter if the Flyers are playing the Penguins, or the Rangers are playing the Islanders, division games will be hard hitting fast paced games that will sell out any arena in the division. Who wouldn't go to a Flyers, Rangers game? Needless to say this division is extremely challenging, with the majority of the teams adding some pieces for next season that they were missing during the '10-'11 campaign. The Penguins are hoping to get Crosby and Malkin back from injuries that resulted in them missing sizable chunks of last season. The Flyers mixed up their roster trading away some of their leaders, but brought in former NHL star Jaromir Jagr, and finally filled the whole in net that has taunted them the past couple of seasons. The Rangers landed the marquee free agent this off season in Brad Richards, he will undoubtedly bring offense to the Blue Shirts lineup. All while the Islanders will continue to rely on Matt Moulson and their cast of young stars to bring their team out of the division cellar.